ChloBo's 'Splendid Star' Collection is inspired by the culture and history of Marrakesh. This collection is designed to be the guiding force behind our lives and offer guidance and support. It is a collection that is based around good luck and fortune. From the new ChloBo collection, is this stunning pair of Yellow Gold Lucky Star Hoop Earrings. The earrings feature a star charm which dangles off of the hoop. Each charm is designed to represent a day of luck. These earrings would make a beautiful gift and would make a great addition to a stack. 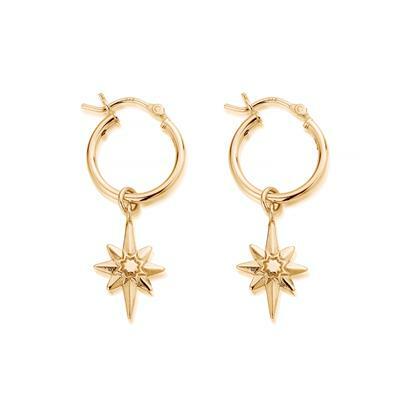 The ChloBo Yellow Gold Lucky Star Hoop Earrings are crafted from 925 Sterling Silver.